Not sure if many of you know this, but when I’m not galavanting around Los Angeles taking a variety of workout classes and attending fitness/fun events, I am a speech-language pathologist for an elementary school. I love what I do, but it also makes me hyper aware of things regarding my field of specialty in my every day life. Read: you probably don’t want to watch a TV show or movie with me as I will point out the slightest speech impediment. Another example is cycling- I enjoy cycling; however, the noise-levels in the studios are extremely loud and dangerous to ones’ hearing. The American Speech and Hearing Association posted an article a few months back in the ASHA Leader about loud spin class music posing a risk to hearing loss. Most of the time, you can find me cycling in a studio with earplugs in my ears to help me maintain and preserve my hearing. 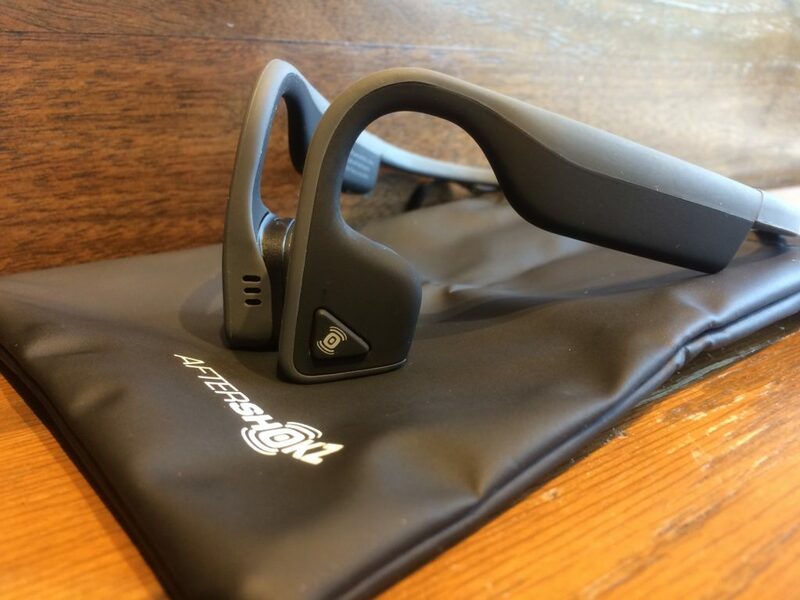 Recently, I received a pair of AfterShokz Trekz Titanium wireless, bluetooth headphones which I’m ecstatic about. Most headphones are in-the-ear or on-the-ear headphones which use air conduction (involving the ear canal and eardrum), but AfterShokz uses bone conduction (loosely meaning: sending vibrations through the bones of the skull to the ear). Disclaimer/PSA: Listening to any noise at a high level for an extended period of time is dangerous to ones’ hearing. 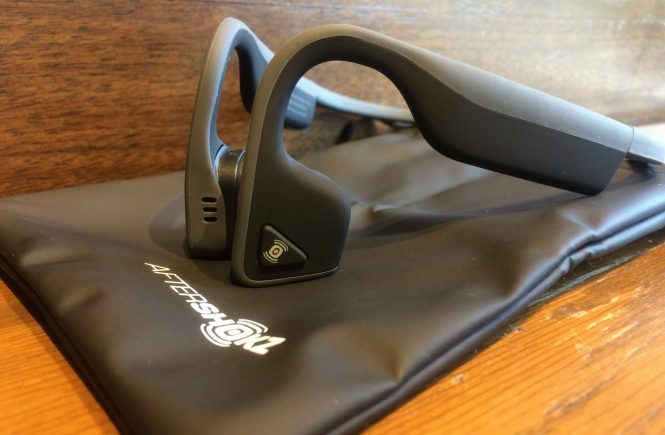 The beauty of AfterShokz is that they are light weight, bluetooth and they sit on the outside of the ear, near your temple, allowing for you to hear your surroundings. Yesterday, I used them during a local 5k. I started the race with a friend so I did not turn on my music as we were catching up and chatting, but had the luxury of wearing the headphones and hearing her and all of my surroundings. Once we split, I easily turned them on with the touch of a button located on the left “bud”. The music turned on and for a quick moment, I thought it was coming straight from the phone as the quality was really good. I quickly realized that only I could hear the music and I wasn’t DJ-ing for the crowd, phew. The button on the left “bud” is multi-functional, allowing you to stop and play audio, skip songs, and pick up or decline phone calls, to name a few. The headset is also multi-point pairing, meaning you can pair it with more than one device- phone, TV, tablet, car etc. There is a built-in microphone for phone conversations and a volume/power button. The AfterShokz kit comes with ear plugs for those times when you don’t want to listen or be aware of your surroundings- like on an airplane when you’re trying to sleep and some bands to help adjust the fit if they are too loose. 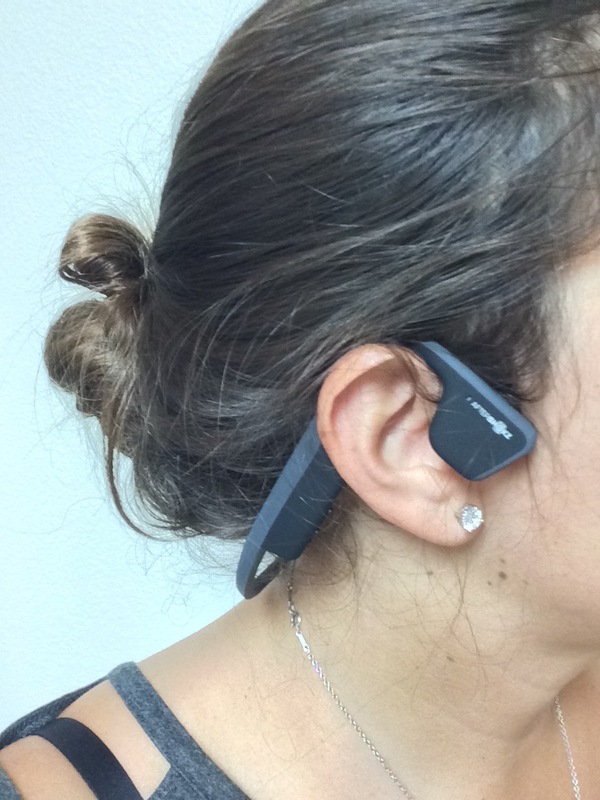 I was recently in the market for a comfortable bluetooth headset that I can wear during races and while working out and glad I stumbled upon this find. 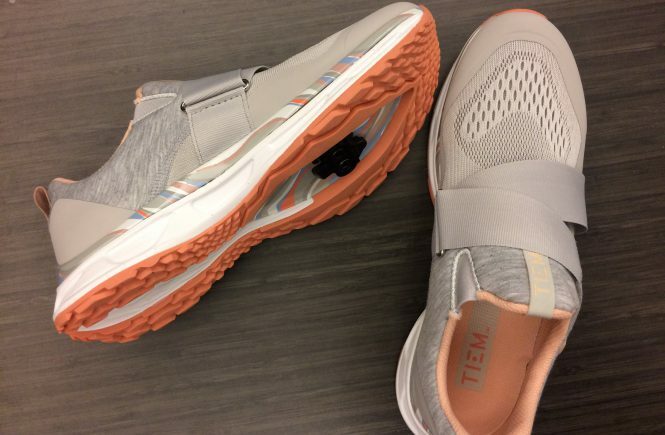 I am excited to further try them out during my triathlons or while bike riding- being able to hear cars, other cyclists/joggers approaching while still jamming out to my tunes. 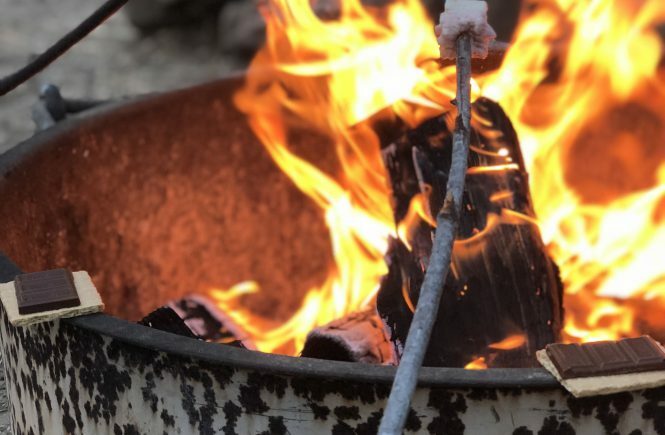 Most importantly, having your ears open allows for you to be sensitive to your surroundings, which makes for a safer user experience. If you’re wanting to try these out, you can receive a free AfterShokz water bottle with purchase using code SWEAT at checkout here. UPDATE: I wore these during a triathlon and I’m even more in love. Not only was I able to be aware of my surroundings, but they stayed on, did not bounce and were comfortable. As per triathlon rules, you are required to wear a helmet during the biking portion. The AfterShokz Trekz Titanium headphones were not impacted by the helmet and/or straps on my head. I was still able to ride with comfort and hear cyclists screaming “on your left” as they rode by. 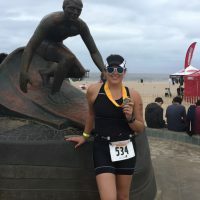 I also race with sunglasses during the running portion and was able to easily wear both which leads me to believe that wearing any head/hair accessories (hats, headbands, glasses) is doable and still comfortable with the Trekz Titanium wireless bluetooth headphones. Again, as a speech-language pathologist, it is important to mention that listening at high volumes for extended periods of times can have an adverse effect on ones’ hearing.